An unlikely group of four keen anglers and officers from Singapore's national water agency PUB took a boat out onto the waters of Lower Seletar Reservoir in the wee hours of a Saturday last month. Instead of casting their rods, they homed in on a 1m-deep secluded spot and gingerly lowered a handmade tray of plants into the water. Their mission: to rebuild fish habitats by installing plant shelters in water bodies. This will give the fish spaces to hide and rear their young, leading to a more sustainable fish population, said Mr Tan Tien Yun, president of conservation group Gamefish and Aquatic Rehabilitation Society. This project is five years in the making. 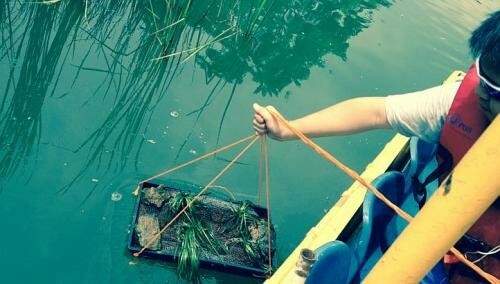 The group of 20 who come from diverse backgrounds - from teachers to businessmen - have been pushing to play a part in restoring waterway habitats. They recently got approval from PUB to start a trial project on fish habitat rehabilitation at the designated fishing zone in Lower Seletar Reservoir. Part of the programme will encourage anglers to adopt better fishing practices, such as not using live bait and nets to catch the fish. But Mr Tan, 32, said the group's key focus is on improving fish habitats, at a time when fishing at reservoirs is becoming more popular. By some estimates, the angler community here is about 200,000 strong - a number that has quadrupled in the past three years. Said Mr Tan, who works in the IT industry: "If there is no fish left, what is the point of reminding people not to litter or pollute the water with discarded bait?" He became interested in the cause after he realised that the number of fishing spots he can hang out at during the weekends has dwindled. "We want to tackle the root of the problem of why the fishes are disappearing," he said. Over the last decade, he estimated that the number of spots where anglers can get a good catch has been reduced by half. This is despite the Government opening up more designated spots at reservoirs for fishing, now permitted at 10. Fish stocks have been depleted in some areas due to overfishing. The high human traffic in these spots also destroys the plant ecosystems which the fishes depend on. The growth of water plants has also been stunted because the ground gets compacted after being overly trodden upon or when they are dredged up by fishing lines. "Instead of demanding more reservoir fishing spots, why not take all these degraded grounds and revitalise them to their original state?" said another member of the group, Mr Marc Chung, 25. That is why Mr Tan and a few other members have taken a small step to start replanting native aquatic plants in the reservoir. They will be going down to check on the plants over the next few weeks. If the plants grow well, they hope small fishes and shrimps will be attracted to the spot. Once the numbers of these small organisms - which form the bottom of the food chain - go up, the bigger fishes such as snakeheads that feed on them will in turn flourish. If this project - tried out for the first time here - works out, the group hopes to expand the programme to other reservoirs. "It seems like a small but perilous start, like a small turtle about to set off to swim in the ocean," said Mr Tan.